"Want to find out more information? Take a look at some other good building resources here!" The building resources contained within our log cabin website does provide a lot of information. We sincerely aim to answer all of your log cabin related questions and if you can't find the answers please send them to us in our question section. We realise though that other related sites might well provide products or further information on related topics which could be of interest to you. The Self Build Guide - A UK based guide to self building homes, looking at all aspects of this subject. From land, design, finance, warranties, construction, to materials and more. The next 100 subscribers will receive (when it is released) the first part of our new ebook free! 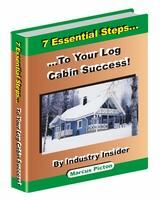 you our Log Cabin E-zine.